The signs are there because of a law called Proposition 65, passed by California voters in 1986 in order to reduce Californian's exposure to toxic chemicals. Now there's an effort in Sacramento to revise the law, amid charges that Prop. 65 has prompted a flood of frivolous lawsuits that make millions of dollars for a select few and cause undue headaches for thousands of California businesses. To really understand Proposition 65, consider an iceberg, says David Roe, who helped write the law when he was an attorney for the Environmental Defense Fund. “Basically,” Roe says, “you don’t see 95 percent of the effect of Prop 65." Those warning signs, Roe says, are just the tip. The real base of the iceberg is made up of places where we see no signs at all, places businesses said, as Roe puts it, “I don't want to tell people there's a cancer-causing chemical in my hair dye, so I'm going to take it out." Roe says this has happened to hundreds of products, everything from raincoats to CD cases and the caps on wine bottles. Companies didn't want to put a Prop. 65 warning label on their product, so they reformulated it to take the toxic chemical out. 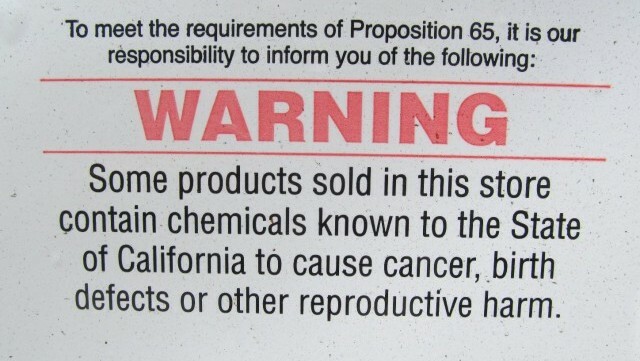 Some attorneys have used Proposition 65 to extract quick, go-away settlements. But there have been other consequences, too, consequences that critics of Prop. 65 consider to be the base of the iceberg. Those have been getting a lot of attention these days. AB 227 “seeks to correct some unintended consequences of an otherwise good law,” said its sponsor Mike Gatto, a Democratic assemblyman from LA, during a hearing in Sacramento last month. “Some attorneys have used Proposition 65 to extract quick, go-away settlements from business owners who haven't put up a sign, or simply haven't put up the right sign, to warn people about everyday common household substances,” Gatto told fellow state legislators. If passed, Gatto’s bill would give restaurants, parking garages and other businesses a 14-day grace period to put up a sign and pay a $500 fee before being hit with legal costs or hefty settlement bills. It would give cover to people like Bette Kroening. Kroening owns Bette’s Oceanview Diner, a cozy neighborhood place on Fourth Street in Berkeley, known for its pancakes. In July 2006, Kroening got a letter from a private law firm, saying that the diner was in violation of Prop. 65. Kroening was taken off guard. It did apply to them, specifically to a brand of old-timey soda the diner sold called Original Nehi Grape, which came in a glass bottle with an elaborate painted label. Unbeknownst to Kroening, the paint contained a small amount of lead. Under Prop. 65, Kroenig should have had a warning sign on the cooler. She worried the violation could cost her thousands of dollars. “I didn’t know how far it was going to go. I felt really threatened,” she says. Right now, businesses have two choices when they get a letter like this: either settle with the law firm in an out-of-court settlement, or defend themselves against the charges. Much of the time, businesses settle out of court, often paying tens of thousands of dollars in legal fees, in addition to an often smaller civil penalty that's divided between the state and the "private enforcer," who filed the 60-day notice through his or her law firm. In 2013, for example, the grocery store Berkeley Bowl paid $22,000 in an out-of-court settlement over charges that it failed to post a Prop. 65 sign warning customers that grilled hamburgers can contain a variety of carcinogenic chemicals. Of that payment, $21,000 went to the Berkeley-based law firm the Chanler Group, to cover what attorney Cliff Chanler described as costs related to testing the hamburger patties and consulting experts. But Kroenig decided to fight. She put a warning sign up on her cooler, then called her lawyer. Eventually the case was dropped. She was never sure why. About a year later the state attorney general’s office sent a complaint letter to the private law firm, headed by Cliff Chanler, that had targeted Bette. The letter said yes, the lead on the bottles was a problem. But it said the way the firm was pursuing this issue was not in the public interest. According to the letter, the firm had turned this lead bottle issue into a cash cow. It had sent out more that 600 letters, like the one Bette Kroenig got, collecting $9 million in attorney’s fees over the course of just a few years. Chanler heads the Chanler Group. For over two decades, few, if any, law firms have pursued as many Prop. 65 cases as his. Chanler says if he’s had a lot of cases, well, that’s because there are a lot of toxic chemicals in our midst, like all the Chinese imports that have flooded the market in recent years. “We’re living in a -- it might [sound like] hyperbole to say [it] -- we’re living in a toxic cesspool. You would not believe the amount of toxics we find in everyday items,” he says. As to the idea that these suits have become too profitable for his firm, and others like it? He says it’s the fair price for the work they do. Next week we’ll meet some of these citizen enforcers, and find out what role they play in the Prop 65 debate.